White House press secretary Sean Spicer has rapidly become the world's most famous PR person. 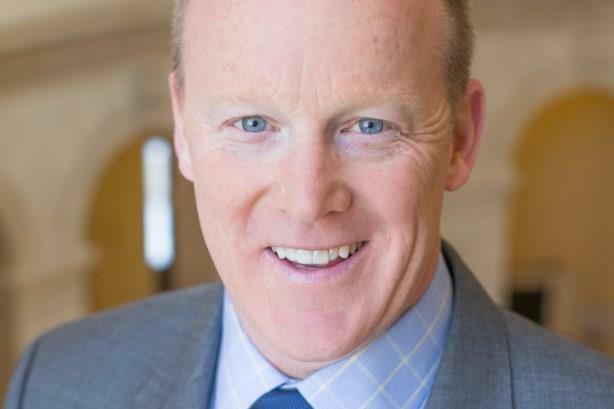 When PRWeek caught up with Sean Spicer late Friday he was heading off for a weekend that promised a trip to his daughter’s school, some work on Saturday, and "a little downtime on Sunday morning." That plan may have been scuppered somewhat following the debut of Melissa McCarthy’s "scarily accurate" impersonation on Saturday Night Live of the White House press secretary and President Donald Trump's communications director, who’s gone from DC political insider to the most famous PR person in the world in two tumultuous weeks. "She needs to chew the gum slower, and not so many pieces," Spicer tells PRWeek via email Sunday when asked about his reaction to the sketch, so clearly it didn’t ruin his day too much. It’s yet another illustration of the unprecedented attention attached to the new U.S. administration and Spicer as its primary spokesperson. "I was prepared in terms of the material, but there’s an intensity that’s totally different and unknown," he says. "I don’t think anyone could prepare you for the scrutiny and intensity." Part of that scrutiny has been self-inflicted, with a now-notorious impromptu Saturday press conference two weeks ago prime among the exhibits offered in evidence against Spicer and the new President by their detractors. Spicer had turned up at the White House prepared for a day of admin and setting up his office, but ended up being sent out to berate the press by a new President who was unimpressed by what he perceived as less-than-fulsome coverage of the previous day’s inauguration. The former RNC communications director admits he could have handled the issue better, but bristles at suggestions he was deliberately lying. "I probably should have taken questions and I could have toned it down a little bit," he says. "From a numbers standpoint I should have double-checked a couple of different sources, but the accusation we were intentionally lying was really low." He also learned that the press secretary job involves being prepared for anything, from presentation to sartorial elegance. "My first press conference was supposed to be Monday. I didn’t go to work thinking ‘hey, I’d better put on my nicest suit.’ You recognize the world has changed and you have to be always on, think what you look like. It taught me a lesson about the level of scrutiny and the level of preparedness." He doesn’t discuss "private conversations with the President" but affirms "he’s never asked me to lie" and "it has never been my intention to do that." For Spicer, lying is a line in the sand he is not prepared to cross as a spokesperson. "I’ve never gone out there intentionally to spread something that wasn’t true," he says. "Spinning your side and spinning your facts to the best of your ability is one thing, outright lying is another. I would never [do that]." He also accepts that a fundamental part of a PR person’s role, whether they are press secretary at the White House or a spokesperson for a company, is to push back on senior leadership if they believe a strategy is wrong or unethical – and that he would do that if he thought it necessary. "It’s really easy for somebody to look at a press conference and say ‘you should have pushed back,’" he says in response to accusations that he reneged on his duty as a communications pro. "They have no idea what those private conversations were. To make assumptions about what was said privately with a principal is [wrong]. When someone says you should have said something, noone knows that you didn’t." The other accusation thrown at Spicer is that he has become the story over the past two weeks, which is anathema to PR pros, taking attention away from the policy messages the new administration is trying to get across. He says: "From a business perspective you don’t want the spokesperson to become the story rather than the issue or the product. My job is to serve the President. The President wants to convey something - that’s my job." But, from Spicer’s point of view, the White House press job is unique compared to a spokesperson for a company or a product. "It’s a very different scenario," he says. "There aren’t many PR people who have five million-plus people tuning into their press events." Spicer believes double standards are applied to Donald Trump by the media, especially compared to the way the Obama administration was covered. "Where was the same scrutiny when the Obama administration talked about Benghazi on the video?" he says. "The media gave them a pass on that. That was a lie. They blamed Benghazi on a YouTube video. I don’t remember a single reporter asking the White House at the time whether they considered that lying and whether they would pledge never to lie again from the podium." Spicer’s other beef on what he sees as media double standards is the respective attitudes to factual errors made by the administration compared to those the media makes itself. Referring to statements made at the Saturday press conference after the inauguration, Spicer points out: "We had checked some numbers in the haste of a Saturday morning to try to get it right. But as I said at my Monday press conference, it’s amazing when folks in the media get it wrong they print a little correction at the bottom of page A17 and call it a day. We try to get it right and may have some numbers wrong; they question our integrity and whether or not we’re lying." The issue was compounded when President Trump’s counselor Kellyanne Conway came out with the concept of "alternative facts" in an interview with NBC’s Chuck Todd on Meet the Press that Sunday to explain Spicer’s talking points the day prior. "Kellyanne was trying to make the point that two plus two and three plus one both get you to four, but neither one is untrue," says Spicer. Spicer reiterated his line from the press briefing the following Monday, which went some way to redeeming an image that suffered from the aggressive and blustering tone on display two days’ previously. "My goal is to get it right every time and to never lie," he says. "You can get things wrong and be mistaken but that doesn’t mean you’re lying." President Trump described the media as "among the most dishonest people on earth" in an address to staffers at the CIA on that busy first weekend, but Spicer justifies this combative approach because of the negative narrative he says the media have adopted throughout the process. "From the time he [the President] announced he was going to run, the default narrative has been ‘he can’t,’ ‘he won’t,’ and ‘he’s not going to,’" says Spicer. "And he’s defied the odds every single time." One thing is for sure, McCarthy’s SNL skit has ensured the heightened attention being paid to the White House’s press function will continue for some time yet. It’s a far cry from Spicer’s previous experiences of the Oval Office during the last day of the George W. Bush presidency, when remembers "we didn’t even have a Twitter account." "The briefings have become an amazing vehicle to get our agenda and our accomplishments out," says Spicer. He’s talked to most of his predecessors and, while they have all offered helpful advice, he believes the role now is vastly different to anything’s that’s existed before. "Every one of the people who have held the job has been really helpful with advice and ideas," says Spicer. "I was with Mike McCurry for a bit [Thursday night] and he had some unbelievable helpful [advice]. Ari [Fleischer] and Dana [Perino] have been particularly helpful. Robert Gibbs, Marlin Fitzwater. It’s a very small club." But no amount of advice could have truly prepared him for the last two weeks. "To some degree there’s a new normal," says Spicer. "There’s a level of interest, intrigue, and excitement that’s never been there before. We’re at the end of week two and the briefing room is still packed in like sardines every day." And after McCarthy’s takedown on SNL you can guarantee it will be standing room only again in the White House press room come Tuesday afternoon when the next briefing takes place. "It brings in voices beyond the Beltway and allows you to hear about issues affecting people outside DC. You can be a reporter for the LA Times but have lived in Washington for 30 years. You’re not necessarily staying in touch with the issues of the people you’re writing to. We get to hear from outside the bubble." "We’re bringing in different voices, such as the Christian Broadcasting Network, everyone from Breitbart to The Daily Caller. It can help inform the room of other issues that may not be playing at mainstream media level. I’ve also tried to add in some conservative voices, some talk radio folks that represent alternative views." "Some folks continue to be the professionals I knew, and there are some who you realize are more interested in getting their click or their clip on TV." By and large you have a media elite that loses touch with what the average American is thinking. "You should give an award to those guys [Dippin’ Dots]. I give them a lot of credit. It was very creative to dig up my tweets from 2009. There was a bunch of guys who went to a baseball game and got a kick out of the fact that, year after year, their slogan was the ‘Ice Cream of the Future.’ I thought it was funny. They deserve a bit of credit for being creative, but it is a bit silly." "For me to do it would be disingenuous at this stage. If I’d just gotten on Twitter, I might argue a little differently. But the idea that I’d been on for several years and have quite a history would be somewhat disingenuous." "I called my tailor! I’ve now been much more selective about what I wear. I joke to people that that one line cost me a few thousand dollars."